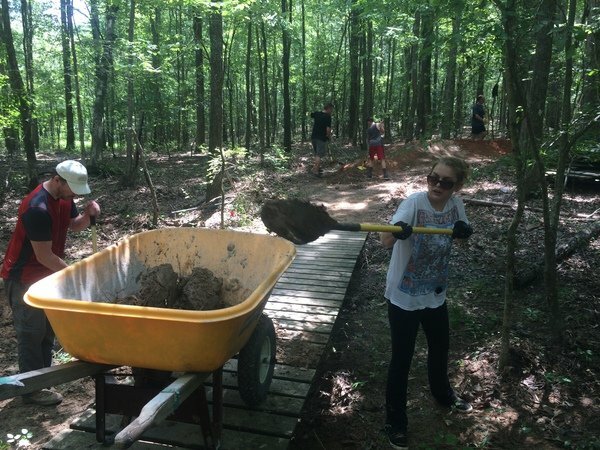 HLCP ‘Berm’ Project yesterday (July 12th) was a huge success! We built two new berms within a tight ‘S’ turn before a elevated ladder bridge. We shortened the bridge to leave us with a straight shot across the bridge. We also dredged out some sediment from the drainage which also provided us with some excellent shape-able material for our berms. We had 13 excellent volunteers, we stayed within a 3.5 hour span and left us with some time for a ride through all the trails. Such a pleasure working with a big group of good people. We got a lot done within a 3.5 hours span and finished with a fun ride. Thank you everyone, as you can see, it makes a huge impression with Ashley and our park relationship.